I discovered a couple of great new places during my last visit to San Francisco. While Chez Papa Resto dishes award-winning French cuisine, Yang Sing brings to this city the magic of Hong Kong's yum cha. 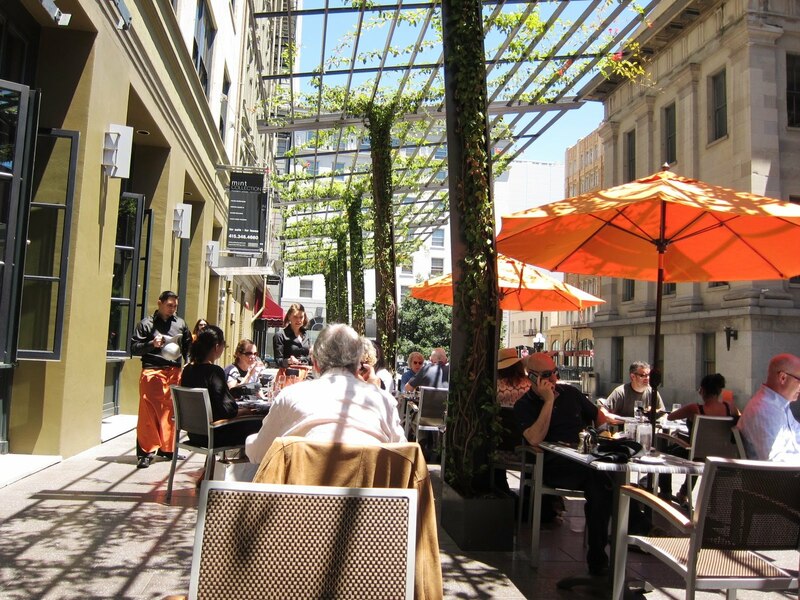 Both restaurants are listed among the Top 100 of the best in the entire Bay Area. One Eastern, the other Western, but both a testiment to culinary art and tradition that has stood the test of time. 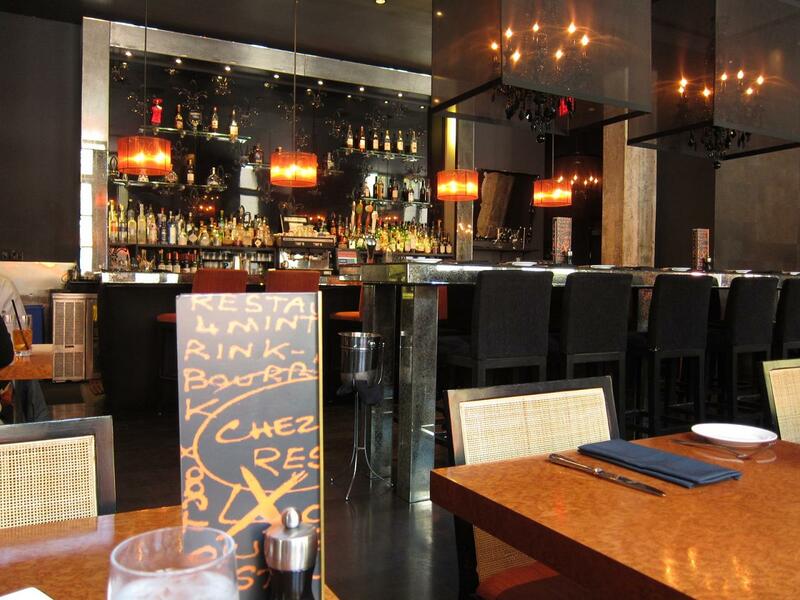 Chez Papa Resto is a stylish little place just off the Westfield shopping mall on the crossing of Market and 4th. 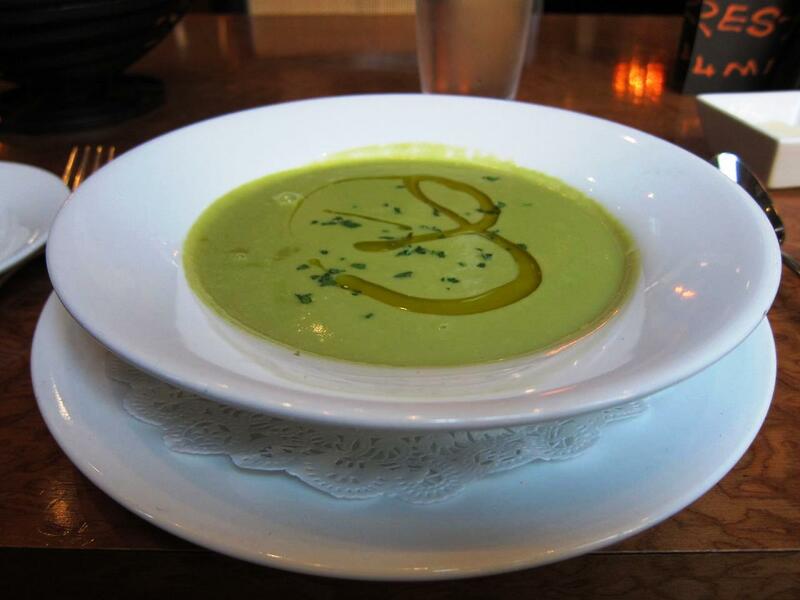 This restaurant was voted one of the Bay Area's ten best restaurants in 2008 and continues to be listed in Bay Area's Top 100 Restaurants. 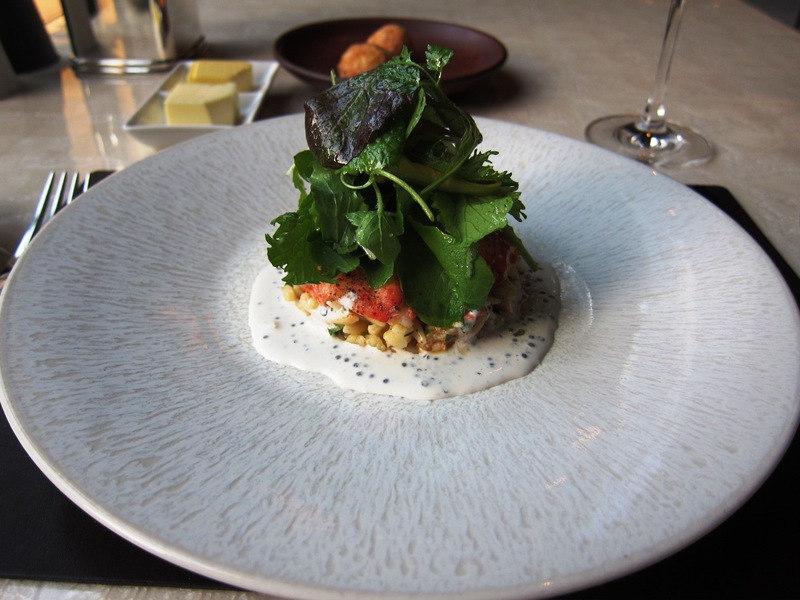 Chef David Bazirgan showcases the region's freshest seasonal ingredients with great deal of attention to detail. This was one of those rare sunny days in San Francisco, so I decided to take a seat outside and dine al-fresco. 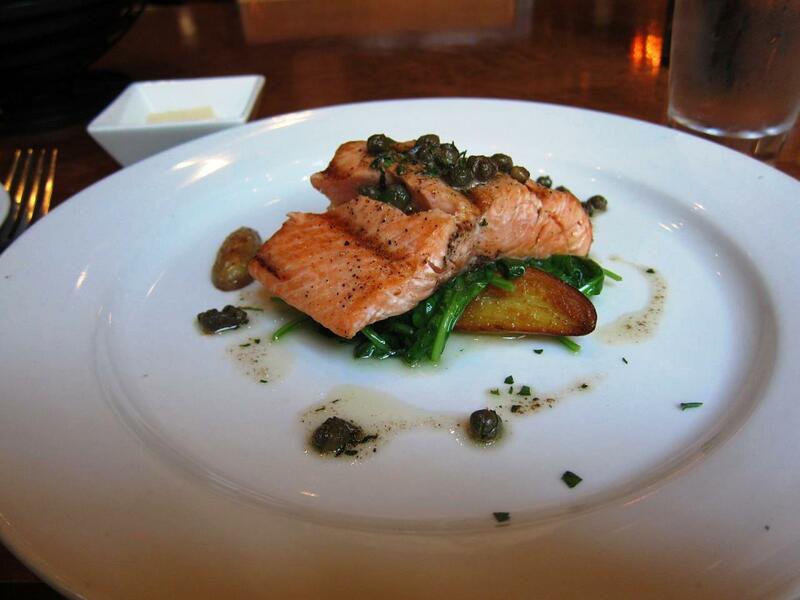 They have a business lunch menu option consisting of three courses that looked just right. They started me off with a butter-lettuce salad that was excellent. 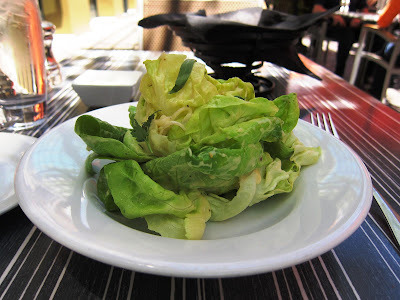 The butter, the fresh and crisp lettuce with the acidity of the vinaigrette was sublime on the palate! The main course of Grilled Hanger Steak was delightful too! I have begun to grow a taste for this particular cut of meat since my first experience. 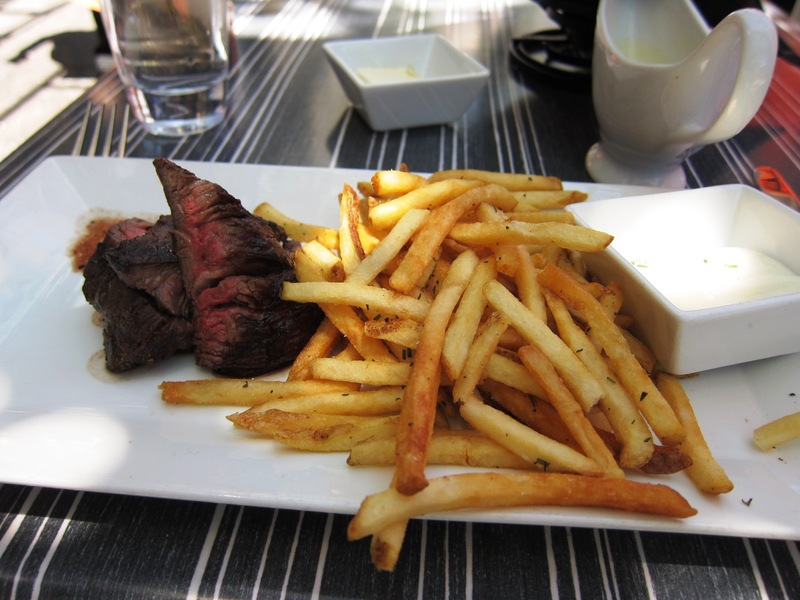 The fries that accompanied the steak was among the best, with a subtle garlic flavor and the perfect crisp outer layer covering a steaming hot, soft interior. 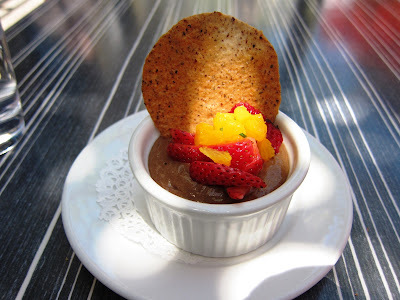 I ended with a chocolate mousse topped with some freshly cut strawberries. Everything about the lunch was just right. Sitting outdoors under the metal lattice covered with vines and the sun peeking through enhanced the experience too. Another time, I returned but took a table indoors. The quality of food on offer continued to amaze me, even though my expectations were higher after the first visit. The soup de jour, a hot cream of bean soup was excellent. The grilled salmon was served on a bed of fingerling potatoes that were fried in their jackets with spinach and capers. Another excellent entree in the business lunch menu. 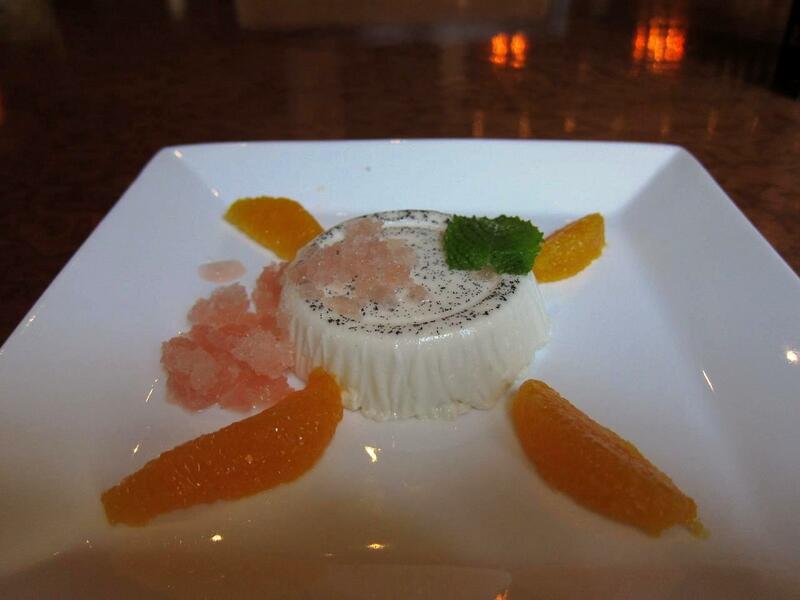 I ended with the Orange Blossom panna cotta with orange sorbet to complete another memorable lunch experience. Yank Sing is a busy place on weekends. There was a long wait for tables and so I decided to take a place at the bar instead. However, the dim-sums on offer are among the best I have had in the United States. Shrimp and pork dumplings, mushroom and chicken sui mui, sticky rice with savory fillings and beans in spicy fish sauce, they were all steaming hot and excellent. The bar was too crowded for me to take pictures. Yank Sing has a lot of history. 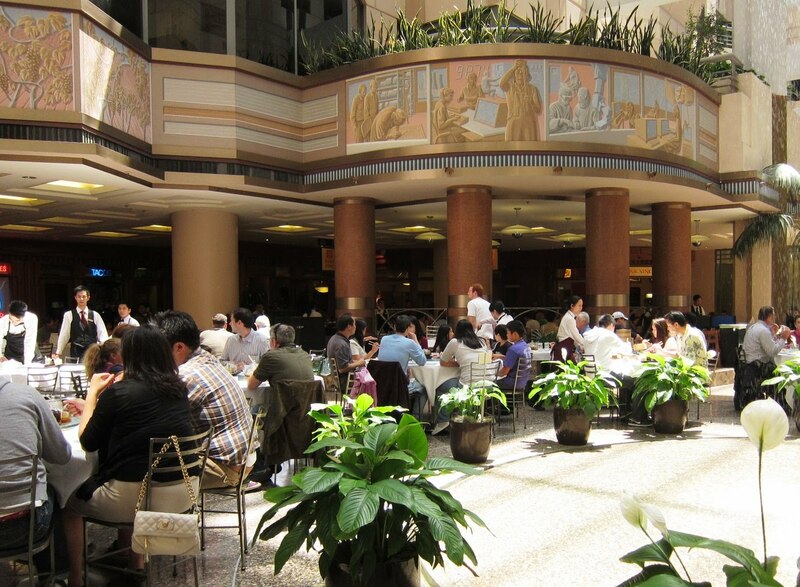 This restaurant, located on Spear Street within the building that houses the US Postal Service, first opened in 1958 by Alice Chan. Her son apparently started rolling dumplings at nine and continued on for 49 years! It continues to be run by her great grandchilden. Prices at Yank Sing are steeper than the regular dum-sum places, but the quality is certainly worth it. As for Chez Papa Resto, if you value high quality food, this is a must visit the next time you are near Union Square in San Francisco. Its been a while since I reviewed a new restaurant in Pune. For one, there hasn't been significant openings in the last few months, but also, I have been travelling too much to sample the Pune stuff! 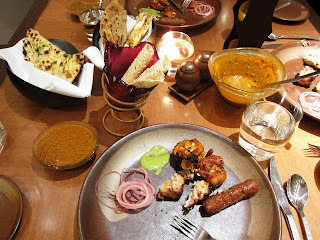 Finally, last weekend I got to try Kangan, the Indian speciality restaurant in The Westin Pune. 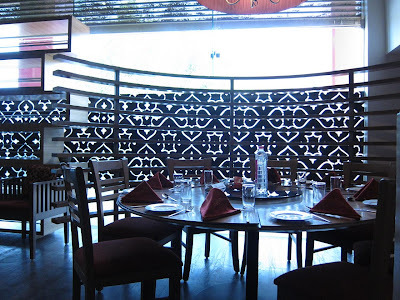 Kangan specializes in North West Frontier and Hyderabadi cuisine. 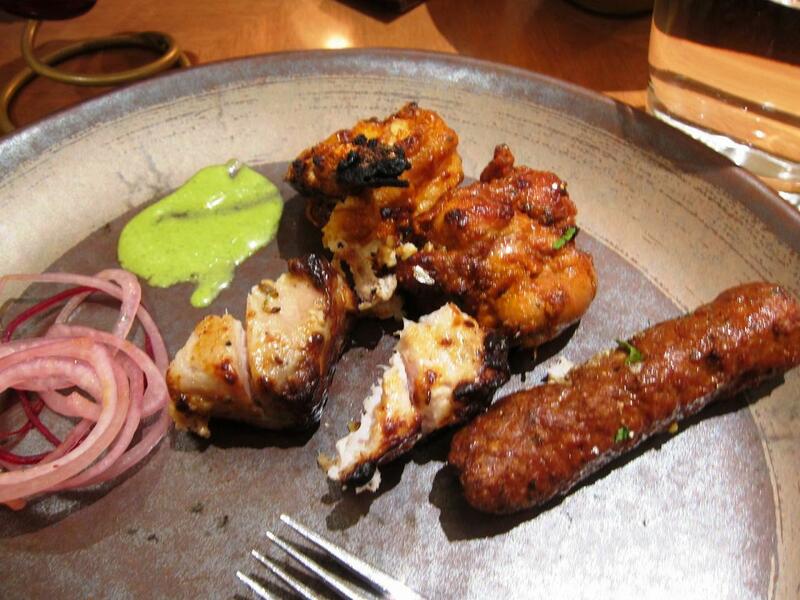 Kababs, biryanis, salans and qormas form the core of their menu. The restaurant is minimalist and while they tried to use traditional bangles as a motif, I wasn't too impressed by the decor. The large pillars within the restaurant seemed to get in the way, rather than adding impact to the surroundings. We began with a kebab platter for two, a kaali daal, a selection of naan and kulchas, and a Hyderabadi favorite: mirch baigan ka salan. A few of the kababs were quite delectible; I loved the kaichi kabab - very succulent and well marinated strips of chicken breasts, and the seekh lazeez. The mahi tikka afgani and the tandoori prawns were a little disappointing because the seafood didn't seem fresh. The murgh chandi tikka, cream marinated chicken pieces wrapped in silver warq, was not bad but not memorable either. 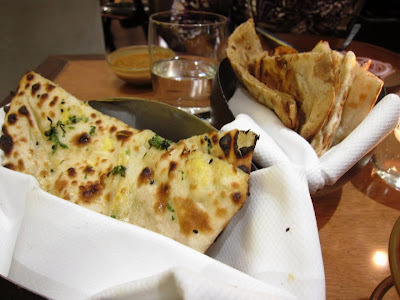 The kaali daal and the freshly made Indian breads were very good, as was the salan. The salan is a Hyderabadi speciality with fried green chillies, baby eggplant simmered in a mildly spiced curry made from peanuts, white sesame, tamarind and coconut milk. The almond, coconut and raisin naan was creative and excellent. We also liked the spiced onion kulcha and the pudina paratha. This was probably the only part of the meal we really enjoyed. Disaster strikes! 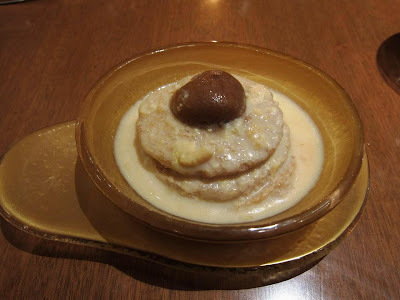 I ordered the shahi tukra for dessert. The dish came decorated with an apricot on the top. One scoop and I knew the dessert was bad - the cream had gone sour; clearly they had served me something that had been prepared days in advance. 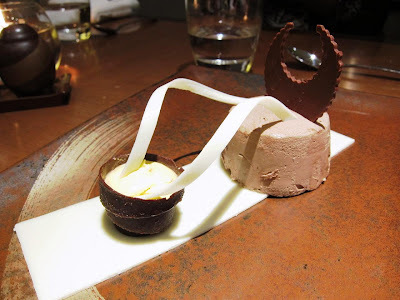 They brought us a chocolate mousse and apologized, but even that one wasn't particularly appealing to the palate - even though the presentation was quite nice. Service throughout was spotty. The waitstaff were friendly enough, but not sufficiently trained. There would be long intervals when it was difficult to get the attention of a waitress - they were too busy chatting each other up! 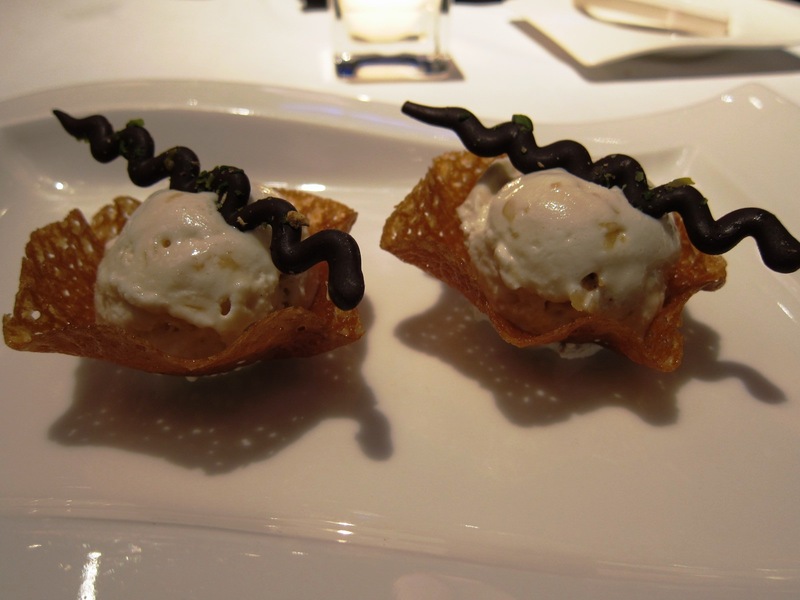 Overall, a disappointing experience, especially because you expect a much higher standard in a five-star restaurant. For now, it is Sigree is a safer bet than Kangan. In the value category, there is a new kid in town. 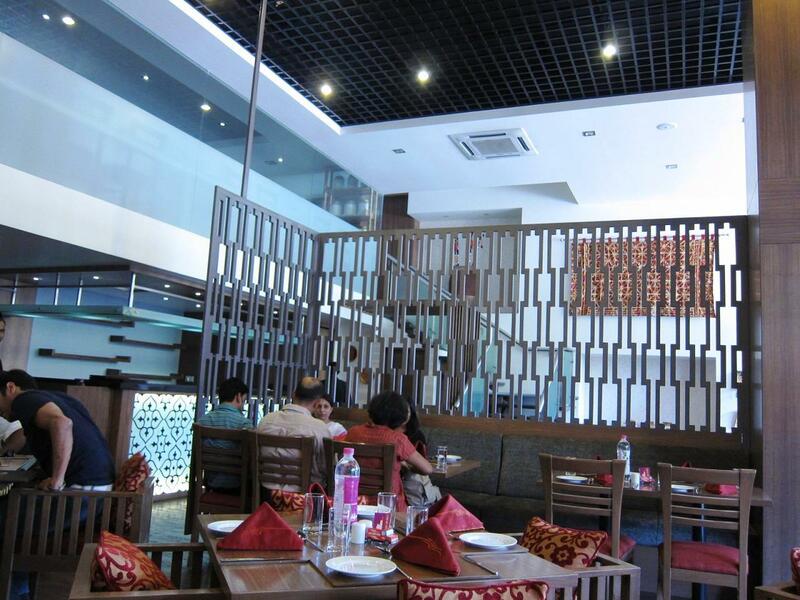 Bigdey Nawaab has opened its doors in Viman Nagar and Dhole Patil Road. The name made me smile! 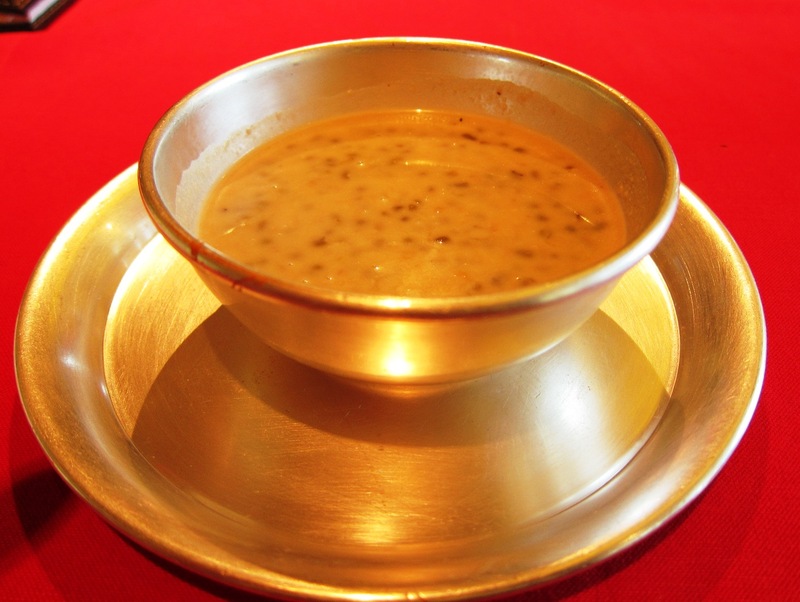 They specialize in Lakhnawi cuisine and serve a mean black daal along with their naan. However, the kababs I ordered were not worth writing about. Taareef in Aundh still is the best among the smaller kabab-biryani restaurants. 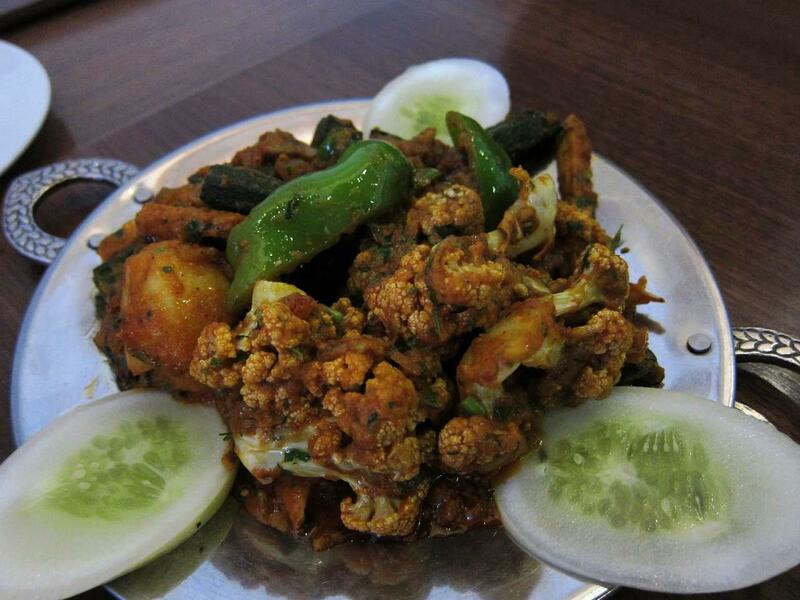 Their murgh kaali mirch and gosht biryani ranks among the best I have had in Pune. Natural Ice-creams introduced a new flavor, Jackfruit. I love all their ice-creams made of fresh fruits and only available in Pune and Mumbai. They have outlets on Moledina Road, next to the synagogue, on lane #7, North Main Road in Koregaon Park and on Ghole Road, just off J M Road near the Pizza Hut. Finally, Great Punjab of Koregaon Park opened their second restaurant of the same name on Baner Road, next to ICICI Bank. Since I was in a lunch meeting with a friend who is vegetarian, I didn't get to try the 'real' stuff. 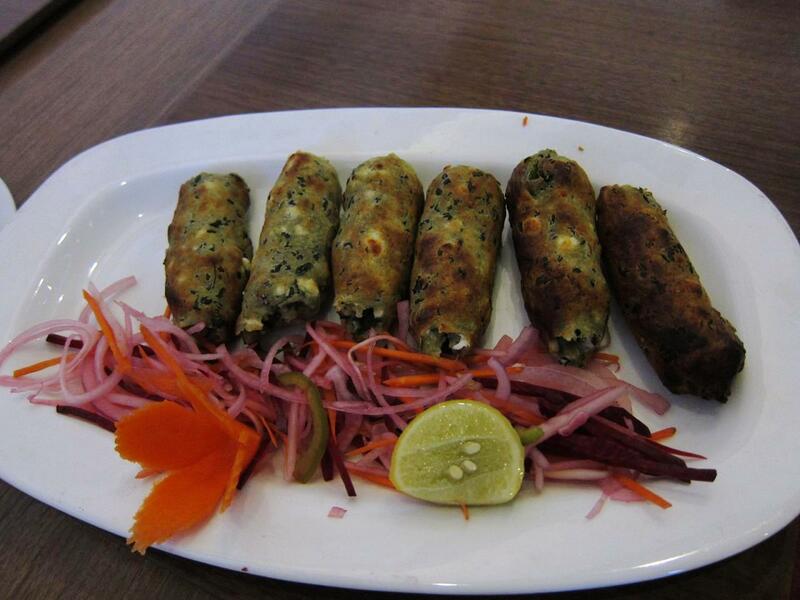 :) The veggie kababs and tarkari weren't too bad but unremarkable. But then, I have never been a big fan of their Koregaon Park outlet too. It was quite a change from chilly, windy and rain-soaked San Francisco. 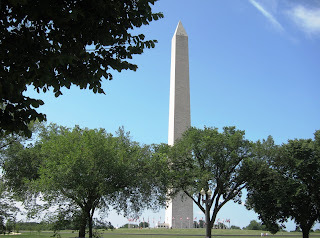 A blast of heat hit me as I exited the air-conditioned interiors of Dulles airport. Washington DC was in the midst of a hot, hot summer! The road from the airport was hemmed in by construction signs, half-complete concrete structures with men in yellow hard-hats busy at work - a usual sight in Indian cities, but rarely seen in the western world now. Apparently, they are extending a metro line here and adding a few stations. The St. Regis in Washington DC is two blocks from the White House and has seen many heads of state pass through its doors during the 84 years of its existance. Designed to outdo the best European hotels of its time, the hotel was much frequented by President Truman in the 50s. President Reagan was a regular visitor here and Robert Kennedy swore by the hotel's chocolate parfait. The hotel was then known as The Carlton. 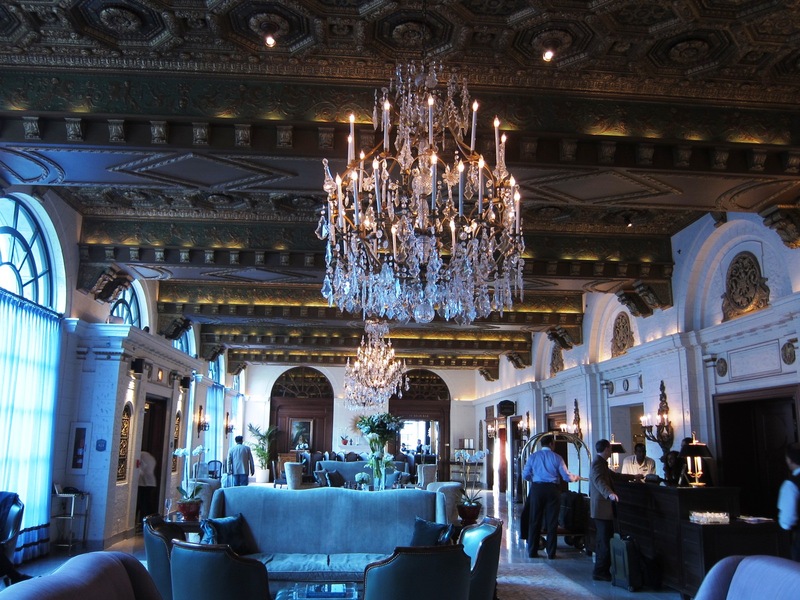 Even now, the hotel's luxurious lobby, the modest sized rooms and baths hint at its old-world legacy. 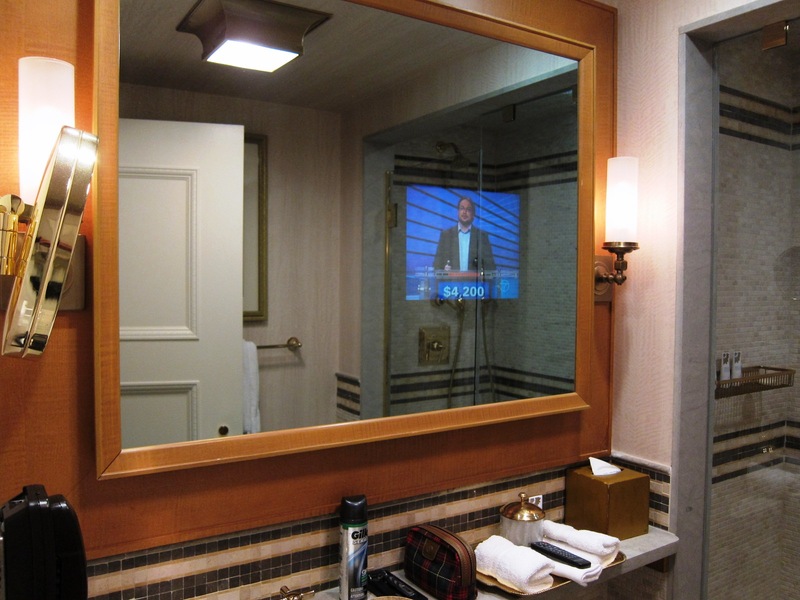 That has, of course, been augmented by the most modern ameneties - such as the 'magic' mirror, a part of which turns into a television screen at the touch of a button on the remote! The St. Regis in DC is also home to Alain Ducasse's Adour, a restaurant that brings the acclaimed chef's talent to the capital city. Comfortable white leather chairs and large illuminated wine racks on either side of the dining room create a very modern and contemporary ambiance in this old-world hotel. They served me three kinds of breads and two varieties of butter for me to nibble on as I surveyed the menu. I found the items I was eager to try - some of them had won awards recently. As I waited for my order to arrive, they served me an amuse bouche of chilled coconut and carrot soup which was spiced up nicely with chilli peppers. I started with their popular Maine Lobster Medallions. The lobster salad of chilled cauliflower and orzo with cavair cream was certainly worth the hype. Loved it! 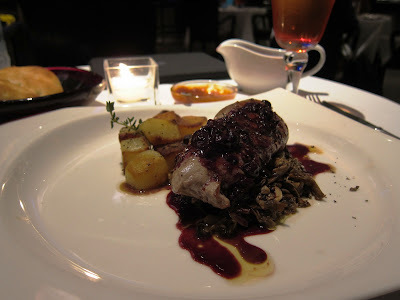 The roasted veal was a killer too! 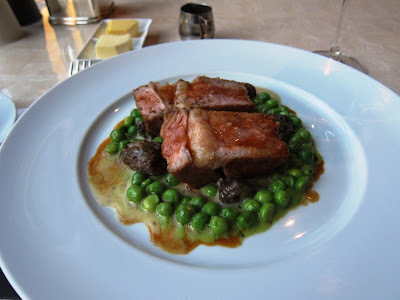 Succulent, fatty veal on a bed of morel mushrooms, English peas and natural jus made for the most amazing experience on the palate. 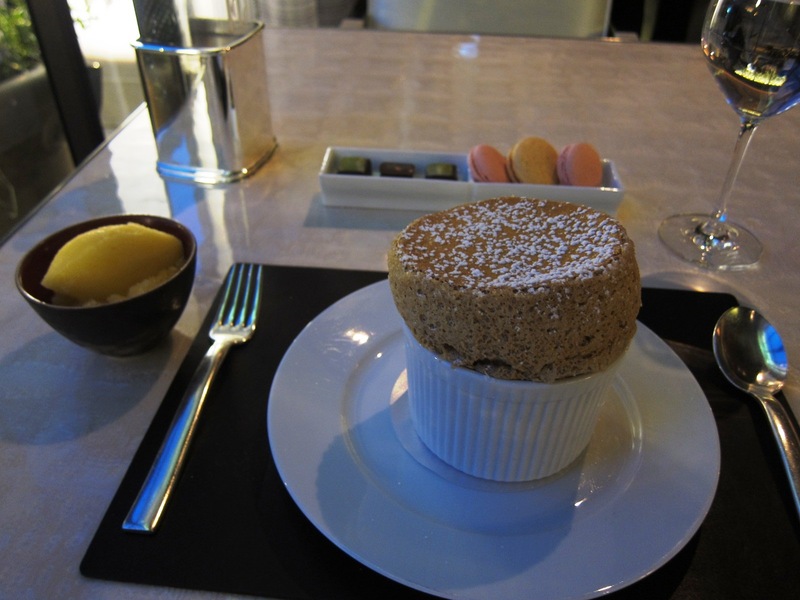 Finally, the Hazelnut Souffle with Orange Sorbet and Granite was pretty good too. Feather light souffle with a definite nutty flavor contrasted wonderfully with the intense tang of the sorbet. 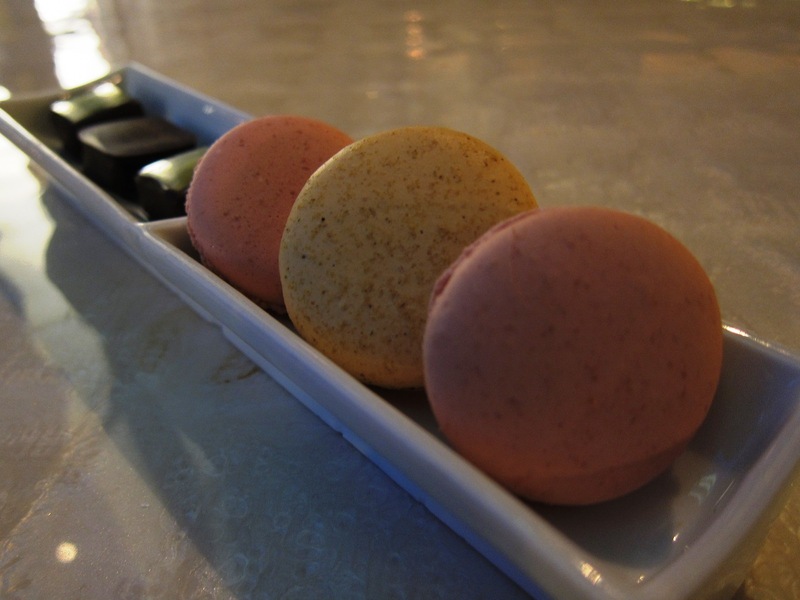 The freshly baked macaron selection and the dark chocolates made for a nice ending to a fine dinner. By now, it was dark outside. The restaurant was now full of power brokers and business people in this nation's vibrant capital. 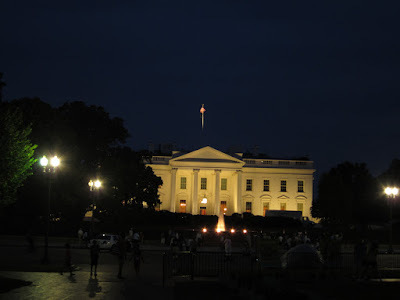 There was a dinner party at the White House in full swing as I strolled around taking in sights that I have seen celebrated (even destroyed!) in Hollywood movies so many times. 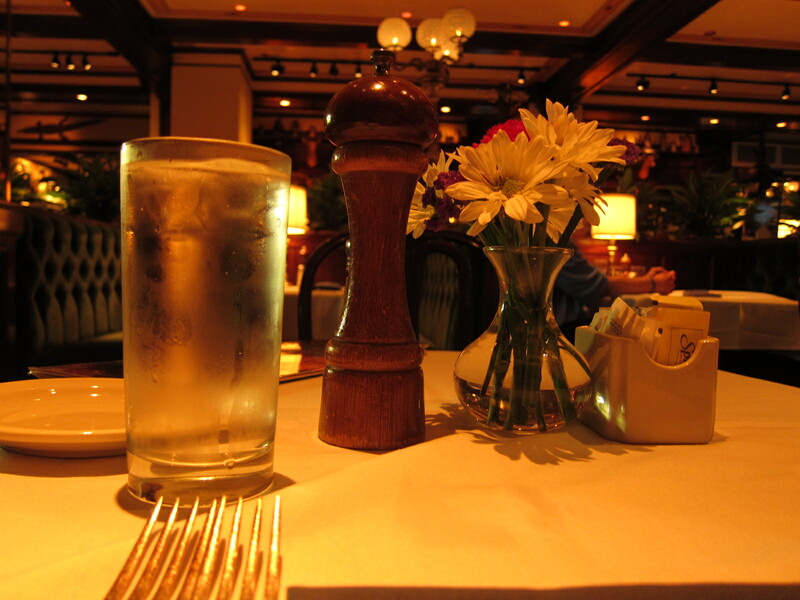 On another day, the concierge directed me to Old Ebbitt Grill which dates back to 1856. Once a favorite of President Roosevelt, this bustling place - steps away from the White House - serves what they describe as upscale American saloon food. I started off with two types of freshly shucked oysters on the half-shell. 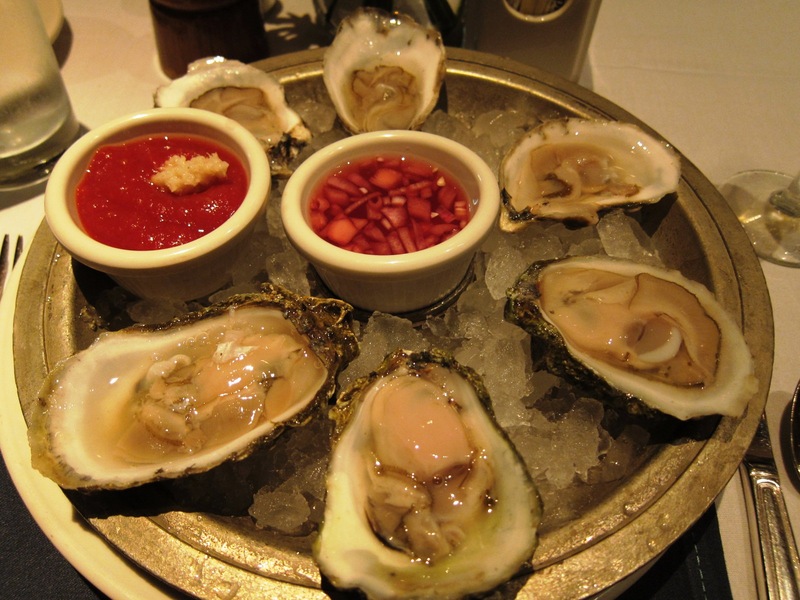 One, the Canadian St. Simon which was small, briny with a sweet finish, the Wellfleet from Cape Cod Bay which was larger and had a very briny finish. 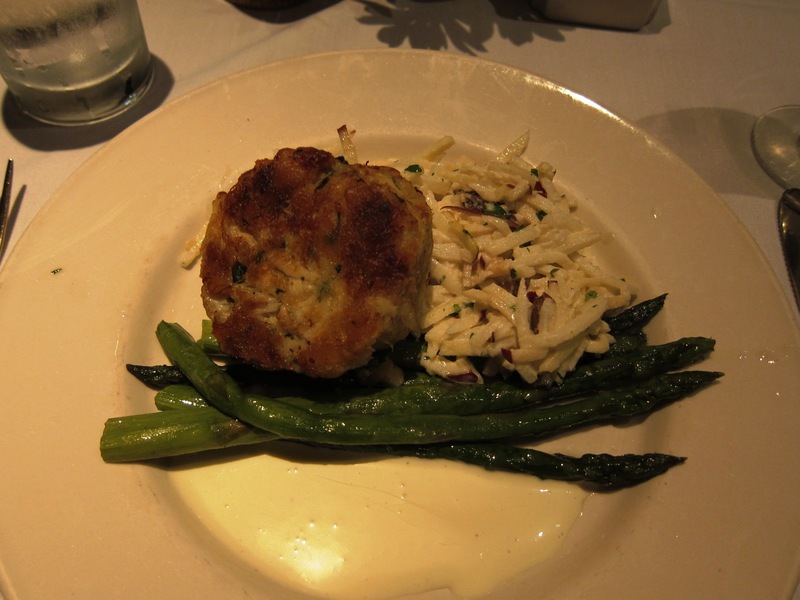 The Jumbo Lump Crab Cake I ordered after that was delicious on its bed of apple-jicama slaw, with roasted local asparagus and lemon aioli. The rains arrived by the time I was ready to fly out of DC, bringing much need relief from the sweltering heat. 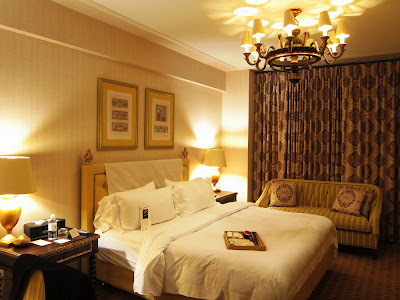 The Trident opened another hotel in Mumbai a few months back. 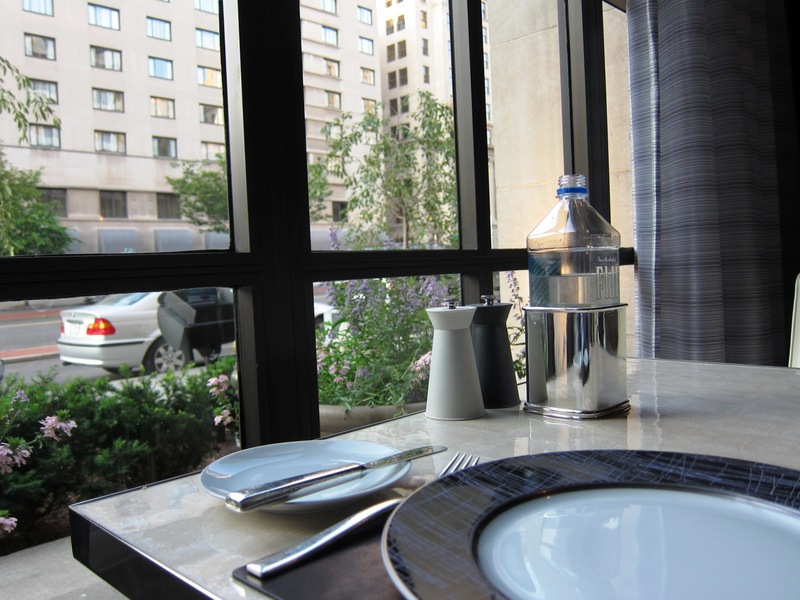 Located right in the middle of the Bandra Kurla Complex, this hotel is home to a couple of good dining options. 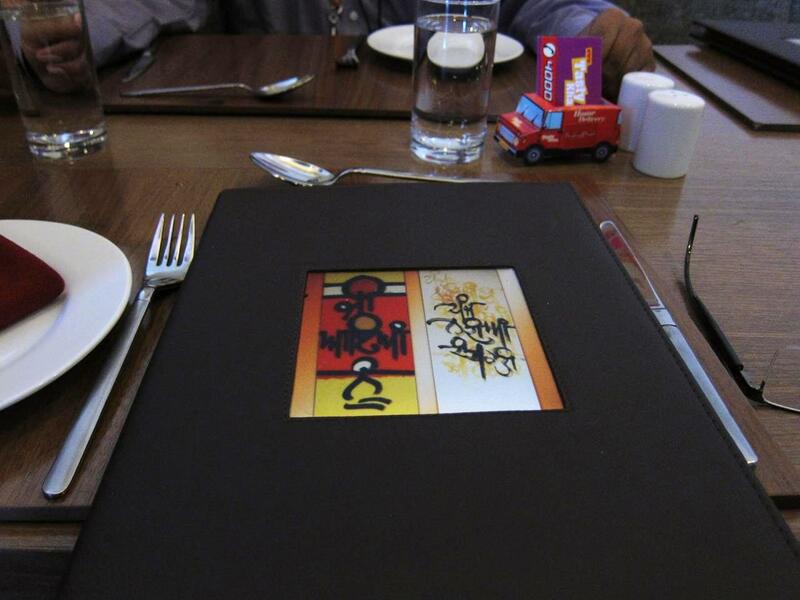 022, named after the postal code of Mumbai, is a great place for a business lunch. The lunch buffet has a variety of Indian and international options including decent sushi and fresh pizza. Botticino serves contemporary Italian food in an unique setting that highlights the grappa and wine culture of Italy. However, today I was at the Indian restaurant, Maya. Maya was completely deserted during lunch unlike 022 which was filled with business type people. I had the complete, undivided attention of the waitstaff; even the sous chef came by to make me feel very welcome! The restaurant itself is a modern affair in bright reds and gold and the menu offers dishes from different regions of India. I decided to try their lunch thali which included portions of mutton, fish, chicken and vegetable dishes. They started me off with a glass of chilled jal jeera, papads and a starter of murgh methi tikka - a kabab marinated with fenugreek and yogurt. 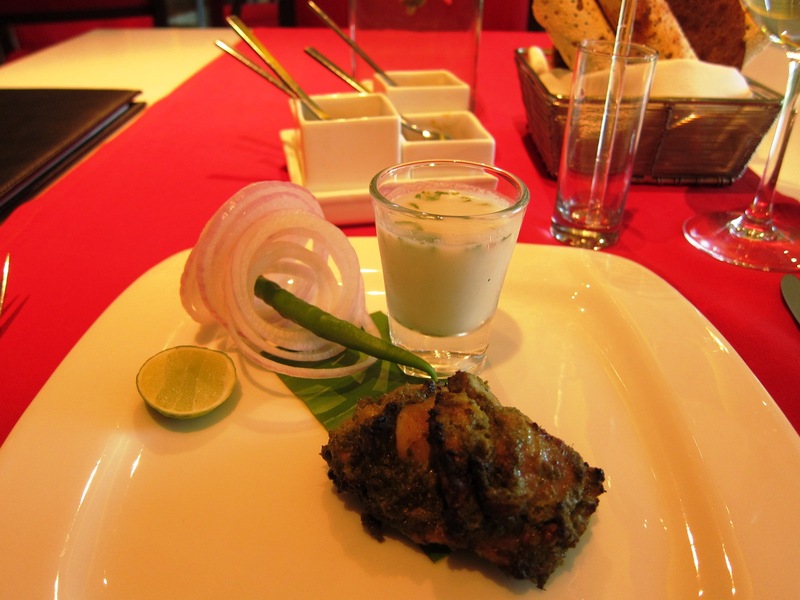 The kabab was succulent and perfectly cooked and the jal jeera was refreshing as I waiting for the main courses. 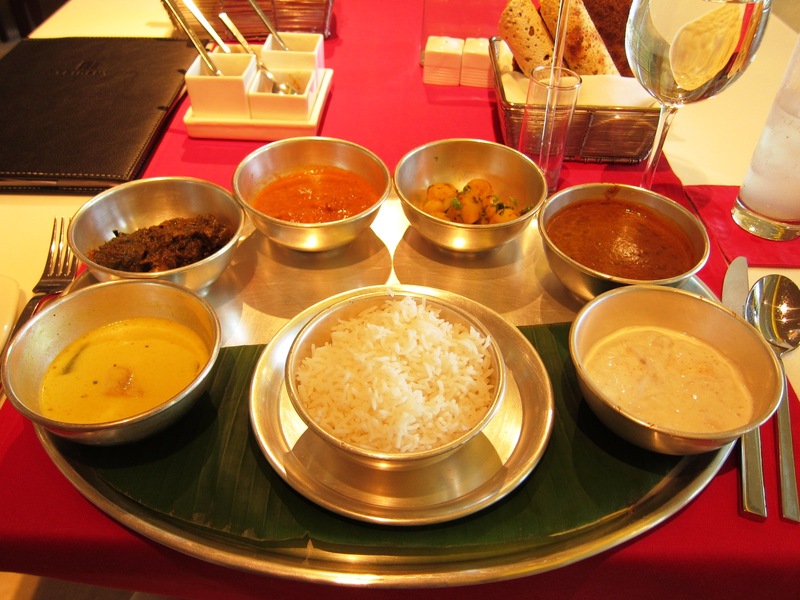 The thali appeared quite imposing: a large bronze plate with bowls of steaming, hot curries! The saag gosht, lamb slow-cooked in a gravy of spinach and mild spices was perfect, as was the murgh makhani, chunks of tender chicken in a thick gravy of tomato and butter. But the best was clearly the meen moilie, fillet of fish in a thin coconut-based sauce, a dish that originates from the state of Kerala. The chef had been light-handed with spices; I enjoy spicier versions when eating Indian food, but otherwise, the lunch was perfectly balanced and the breads were excellent too. Dessert was another South Indian delicacy, a warm payasam made of whole lentils - mildly sweet and a nice end to a filling meal. 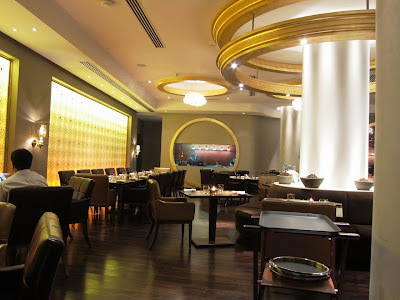 I also returned to Stax, the Italian restaurant in the Hyatt Regency, Mumbai. Unlike my previous visits, the restaurant was busier - always a good sign! The waitstaff were as efficient and helpful as ever. 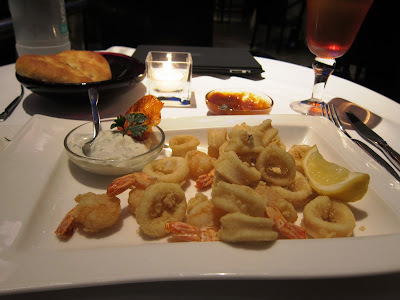 Since I had a flight to catch in a few hours, I passed the wine list and quickly settled for a starter of fried calamari followed by the popular pork tenderloin dish on the menu. The calamari came mixed with some fried shrimps too and wasn't particularly remarkable. However, the pork was quite interesting. The tenderloin was served on a on a bed of sauteed mushrooms and served with golden crispy tater tots with a cranberry sauce. For dessert, I had scoops of the home-made seasame ice-cream which were fantastic! 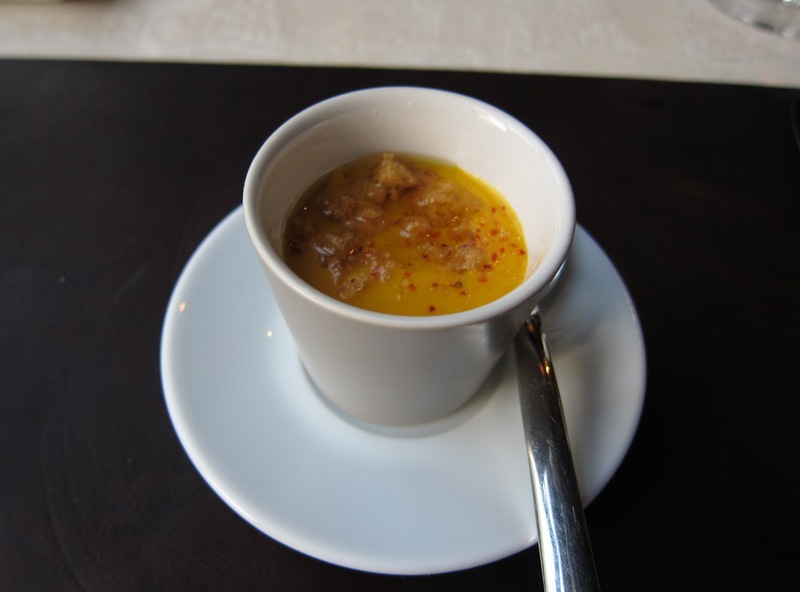 Chef Alessio Banchero has been offering his Nuovo Spring Menu for the last couple of months. This is a good place for a quiet dinner if you are close to the International Airport. Note: My previous visit to Stax is posted here.